Take Back Your Internet with Golden Frog! We’re back and hosting our annual event on March 9th during this year’s SXSW! In the past, we’ve discussed myths around online privacy and security, encryption, and the importance of an open Internet. 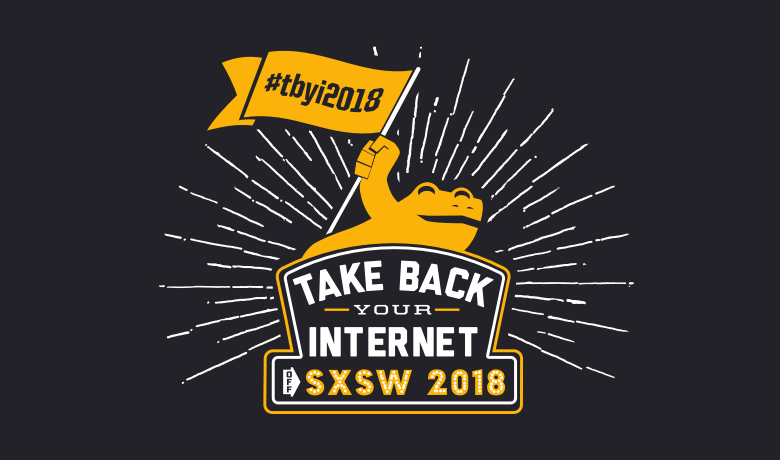 The Texas Public Policy Foundation is joining us in hosting our Take Back Your Internet event this year, and we’re excited to discuss the current state of the Internet around the world. We hope you’ll join us! The FCC recently voted to repeal net neutrality guidelines and was met with extreme pushback from the public. Now that net neutrality provisions are officially gone, it’s time to look forward and find a new solution to ensure that Internet users in the United States have access to an open Internet, without restrictions on their speed or access imposed by broadband providers. Golden Frog believes open access is the best solution! This year’s Freedom on the Net revealed the alarming fact that Internet freedoms continue to decline worldwide for the 7th year in a row. As more countries filter and censor the Internet and block important tools like VPNs, it’s imperative we fight back and grant Internet users around the world the Internet freedoms they deserve. Who should retain ownership of your personal data? What rules should companies follow when collecting, saving and even selling this information? We’ll discuss privacy implications of all the data being shared online, and the concept of personal data as property. This year’s event features the following panelists, who will tackle the questions above from unique points of view. Philip drives the technology development and decisions for our products and services, and has over 20 years of experience working with Internet service companies. Philip is responsible for scaling Golden Frog’s products and services and designing and implementing new technologies, including VyprVPN’s proprietary Chameleon technology. Rachel is currently focused on developing policy priorities and engaging with lawmakers to promote startup interests in Washington. Rachel is a veteran in tech policy, with deep experience in government and the private sector. She recently managed policy advocacy for some of the nation’s leading tech companies, and, before that, served as Legal Counsel for Congressman Blake Farenthold.